A new season is upon us, and recently while looking through my closet, I decided to reflect on the wise words of Diane von Furstenberg - "Personal style is accepting who you are." There are so many things I've bought through the years, worn once and realized they are just not "me". So, I'm cleaning house! I'm making some (more) trips to Goodwill, and also listing my things still in great condition on Poshmark. If you are interested in checking out my Poshmark closet, you can do so here. Back to the fun stuff - the lady of the post - Ms. Diane von Furstenberg. Known for her iconic wrap dresses, she creates clothing for sophisticated women that are strong yet embrace their femininity. For her fall 2013 collection, she drew on her younger days partying with the likes of David Bowie and Mick Jagger and said, "It's not about going to a party. It's life as a party." It is filled with rich suedes and leathers mixed with bold pops of cobalt and berry and peppered with leopard print. Still haven't had enough DVF wisdom? 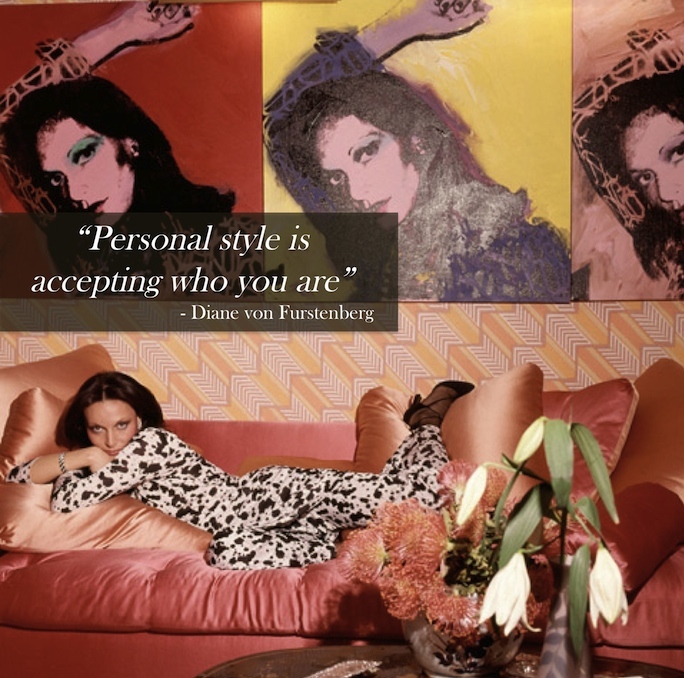 Into the Gloss shares some more great quotes from Diane von Furstenberg. I just did a huge closet cleanse as well, and it felt SOOO good! I think that quote is AMAZING. i love that her wrap dresses come back season after season. one day i will invest in one! she's a very smart lady, and i adore this quote. That is so true.....DVF is such a style icon esp. her incredible wrap dresses!